Now that our pregnancy is in full swing and I mean full (my belly is the first to enter any room nowadays), I decided to go through all of McKenzie's infant items to see what we have and what we would like to add for baby #2. While we pretty much have all the basics covered, the baby world is constantly adding exciting new products on the market and I can't wait to add a few to our pre-loved infant assortment! 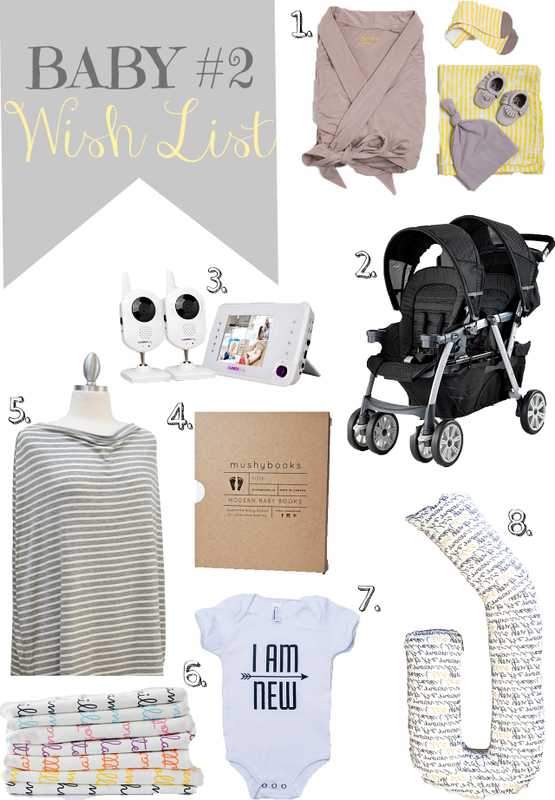 With our registry for baby #2 in the works, I'm highlighting a few of my favs that we'll definitely need and a few fresh new items that would be nice to have this second time around. 1. Freshly Picked Bringing Home Bundle: To say I'm a fan of Freshly Picked Moccs is an understatement. FP brand has come so far in such a short amount of time and it is easy to see why. Their vision and execution of quality and cuteness exceeds so many others. Of course, they have expanded their line with adorable little outfits for your baby to wear with their Moccs and my personal fav is their Bringing Home Bundle. This set includes what you see here + a coordinating tote bag (not pictured). It's the perfect cozy way to welcome your baby into the world in comfort and style! 3. Lorex Baby Monitor W/Two Cameras: My first baby is 2.5 years old now (I guess she's technically not a baby anymore), however I still keep a monitor in her room to spy on her at night while she sleeps and to be able to hear her breathe, which is actually my favorite kind of white noise to drift off to sleep to. With that said, when baby #2 comes along I would like to have a camera in his room as well and have them both sync up to one monitor. Now that I've found this gem from Lorex, it will be nice to have both my babes on one screen and just one look-see away. 4. Mushy Books Modern Baby Book: If I can be honest, writing in a baby book everyday (or every milestone for that matter) is not my idea of fun. For McKenzie I actually set a timer for each month to sit down and write down all of her new developments for that month and it just wasn't something I enjoyed spending nap time doing (but I didn't have the heart to stop either). However, now that I've found this lovely book from Mushy Books- the adorable modern page designs definitely create a fun and unique space to write and will be exciting to open up every month! It's a bit more than most baby books- however the quality in craftsmanship and page designs are something you can't find anywhere else making this book more of a showpiece rather than a regular baby book that you would end up hiding away in a closet. 5. Cover Goods Multi-Use Nursing Cover: My first nursing experience was not pleasant to say the least. I powered through 3 months of nursing and each day was a struggle with latching issues, slow milk production and multiple infections. With that said I do want to try and it give it another whirl with our second baby in hopes that I will be pleasantly surprised with a more calming experience. With so many nursing wraps out there- this one stood out to me as it is so multi functional. It could be worn as a fashion piece, a baby carrier cover as well as a hideaway during feeding. The simple yet chic designs of these covers are beautifully selected and they don't scream "Look at me I'm nursing!" - which I love! 6. Jennifer Ann Personalized Blanket: I've had my eye on Jennifer Ann for years just never got around to purchasing one of her adorable personalized items. I've decided to make it my mission to at least incorporate a swaddle blanket into baby #2's essentials. The fonts, the colors and the quality are so charming and unique and would make for a wonderful newborn photo prop announcing our baby's name! 8. Bump Nest Pregnancy Pillow: This technically isn't something you would use after baby is born (at least I don't think so- correct me if I'm wrong), however I wanted to add it to the list because I never purchased one with my first pregnancy and I wish I would have. After welcoming a newborn into the world, sleep is pretty much not an option. So the time that you do have to sleep leading up to their arrival must not be interrupted. I had the worst trouble getting into a pleasant and comfortable sleeping position when I was pregnant with my first and I'm hoping this time around having a pregnancy pillow will help get those extra Zs in before they vanish in September. I'm in love with that onesie! Have you tried out the Lorex camera yet? My husband and I are on the market for a new video monitor and we just haven't found the right one yet. We haven't tried it out yet. I'm hoping to order one soon though! I'll meet you back here once we do and test it out!